One of the most unique half marathon and 10k runs. If you haven’t registered yet we’d love for you to run the half marathon or 10K with us this year. Start the running season on a brand new course. I know some of you love to run hills and others not so much. Since we had that big hill for 10 years we thought we’d flatten things out a bit. Yup, it’s still rolling hills but compared to the previous course this one is flat. A great big bonus for you is that this new course ventures to the far reaches of the previous marathon course (yes, no marathon this year, we focused on the half/10K). Former marathoners always commented that the really beautiful scenery was the run beyond the turnaround. What makes this a unique half marathon and 10k? You can hope to see Amish runners, horse & buggies, mule teams in the fields, cows, sheep and all the amazing things that make this one of the most unique races in the U.S. In addition, the Half Marathon is still a Road Apple Award run. Complete Garden Spot in the spring and the Bird-in-Hand Half Marathon in the fall and earn the Coveted Road Apple Award! If you plan to run Boston our Half is a perfect taper run and we’d love for you to join us. Depending upon your training plan the 10K might also be a possibility. The 10K has great scenery and you get all the same amenities as the Half, including that cool medal above. Where the image reads 13.1 it will say 10K. In the back it says: Finisher, the date & New Holland, Pa.
One of the things that makes the medal really cool is that in addition to being modeled after our hot air balloon, it has a tab for the ribbon and a stand under the basket so you can set it on your desk or mantel! 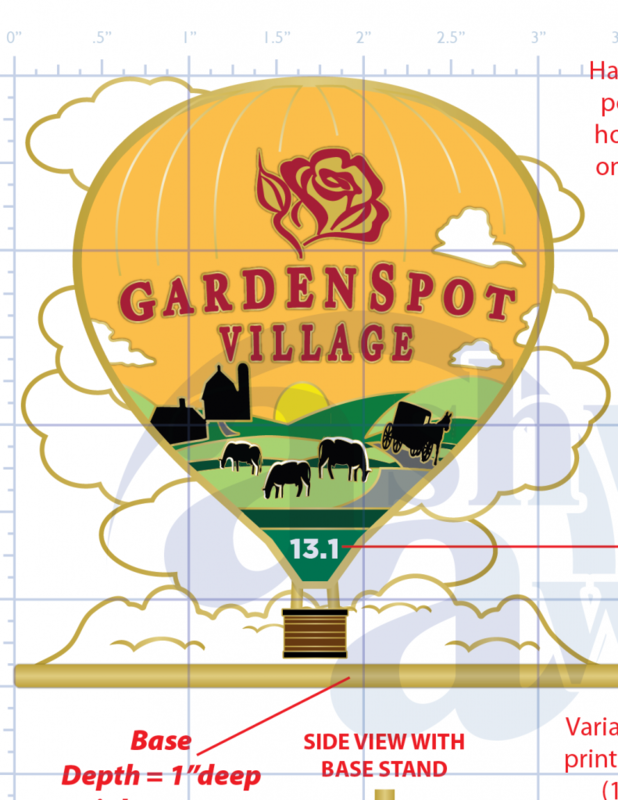 In honor of the balloon medal we’ll be pulling a bib from among the finishers and one happy finisher will win a free hot air balloon ride for two. That’s reason enough to register. But, to go on . . .
You can expect the same great recovery tent, concessions, massages (Half & 10K), changing tents, bag check, PR & 1st Half/10K bells, photo wall, locker room, showers, heated pool and spa. All you can eat pasta dinner and expo Friday evening. We run for a variety of reasons. I think deep down all of us run because at the end of the day we just absolutely love it. Three quarters of the way through the course we might be questioning our sanity. We may claim never again! And yet, we always sign up for another run. Yeah, we pant. We choke. We gasp for air. Our legs feel like jelly. We put band aids in unmentionable places. We risk our lives on the road with inconsiderate motorists while we train. And yet, we all know, it’s worth it. Getting out there on a brisk spring morning with other runners who are just as crazy and happy is the best. There is so much energy in the air at the starting line only runners understand. Then when the endorphins kick-in it’s like a taste of heaven. April 5 & 6, 2019. Pasta Dinner, Expo and Kids Marathon – Friday, April 5th. Half Marathon & 10K – Saturday, April 6th. Course is open for 5 hours and walkers are welcome.